We are extremely honored to present the great musician Francis Chapelet. Post-World War II Europe produced an amazing assembly of legendary interpreters of Early Organ Music. Francis Chapelet is one of the last remaining masters of his generation still actively concertizing. His interpretations of this rich repertory of music are based on a lifetime of playing the great historical organs throughout Europe. His concerts are known for playing of color, boldness, grand sweep, but also nuance, tenderness, and, always, deep musicality. His rich program of Baroque music will feature works from Spain, France, and Germany, including major works by Johann Sebastian Bach. 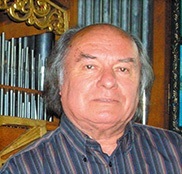 Following this recital, Chapelet will be retiring as a concert organist. This will be his last recital in New York City. Tickets can be purchased online at www.VoicesofAscension.org or call the box office at (212) 358-7060.